This is an album by veteran Polish Jazz pianist / composer / bandleader / educator Leszek KulakowskiFind albums by this artist, recorded in a quintet setting with Polish rhythm section: bassist Piotr KulakowskiFind albums by this artist (Leszek´s son) and drummer Tomasz SowinskiFind albums by this artist and with Swedish saxophonist Mikael GodeeFind albums by this artist and percussionist Ebba WesterbergFind albums by this artist. Together they perform eight compositions by the Polish Classical composer Frederic ChopinFind albums by this artist, arranged for a Jazz quintet by Kulakowski and Godee, each contributing four arrangements. Over the years Chopin inspired Polish Jazz musicians very often and the number of Jazz albums based on Chopin´s music is truly abundant. Kulakowski visited Chopin´s music several times throughout his recording career, but obviously his fascination with the essence of Polish music, which Chopin represents more than any other Polish composer, refuses to let go. 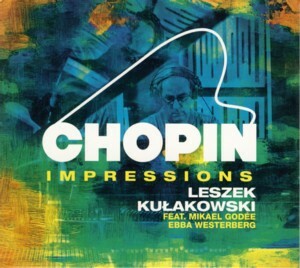 This album presents a more gentle and reflective approach to Chopin´s music than Kulakowski´s earlier recordings. The intrinsic melancholy dominates the proceedings and the minimalistic and delicate touches of the keyboard are the most essential and enjoyable moments this music offers. The saxophone parts are mostly straightforward leaving the centre stage as far as improvisation is concerned to the piano. The soprano saxophone sounds a bit like flute at times. The rhythm section does a beautiful job filling the blanks and keeping the pulse of the music clear and steady. The percussion parts are mostly decorative and are typically heard on the up-tempo pieces. Overall this is a fine album, which should make the many connoisseurs of Jazzed up version of Chopin´s music very happy, especially since it includes some of the most well known pieces composed by Chopin. It is made with obvious love of the subject matter and profound dedication and is a true joy to listen to.